Colours are an Important part of Magic and Healing. They effect us greatly in our everyday lives from the Radiant Light of the Moon to the soft Green of a New Leaf. This Leaflet lists 13 different Colours and some of their magical uses. 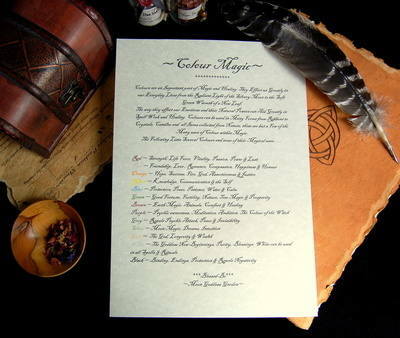 This A4 poster has been printed on high quality Parchment paper and has been Designed by ~Moon Goddess Garden~ from our own Book of Shadows, ideal to add to your own!